Click here to see a list of vendors who currently submit samples to the BSC for testing and Certification. The list changes from time to time. The BSC testing laboratory can Certify, re-check, or do experimental tests on samples from a batch of any material (dye or other substance used as a biological stain), based on your needs. Click here to see the list of stains for which the BSC provides testing. The BSC’s requirements for certification are published (Penney, Powers, Frank, Willis and Churukian 2002). Changes to the tests and standards since 2002 are briefly reviewed elsewhere in this web site as News about Dyes and Stains. Certification. Request testing for certification when the batch has been purchased from another company or manufactured in-house, has not previously been certified by the Biological Stain Commission, and does not have a current BSC code number in the form of CD-# (where C is the company designation, D is the dye (or other stain) designation, and # is the batch of the CD combination). A BSC code number is generated for each batch tested for certification. If the material meets the BSC’s published standards, a certificate is issued to the vendor, who may sell material from the batch in containers bearing labels with the allocated BSC code number. Experimental. Experimental testing is chosen when a batch of material has either been purchased from another company or manufactured in-house but is not yet intended for sale as a biological stain. Experimental testing is often requested when there are questions about the quality of a batch. For example, a vendor may ask the BSC to test samples from a new manufacturer or supplier. The BSC reports the results only to the company requesting experimental tests. The tested material is not certified by the BSC and may not be sold as a certified stain. Re-Check. Materials previously certified by the BSC, with BSC codes, are often resold to other companies. New lot numbers are assigned, and stains are repackaged and/or shipped to new locations. The BSC requests notification of every change of ownership of part of a batch of a certified stain. As a quality check, a sample from a previously certified batch should be sent to the BSC for verification that it is the same as the certified material, and can be traced to its original certificate. 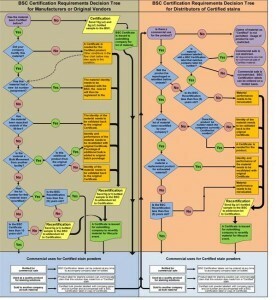 BSC Certification Requirements Decision Tree. This flow chart is a general guide for necessary steps in maintaining the Certification status for a Certified stain. The chart is divided in one half for Manufacturers and vendors of Certified stains and another half specifically for distributors. Most of the life-cycle events which destroy the traceability of a Certificates’ reference to a powder are identified here. In these instances, additional steps are required to recertify these materials. When a stain is Certified, all commercial uses are supported and endorsed by the Biological Stain Commission (detailed the bottom of flow chart). Specific situations or questions about these processes should be discussed directly with the BSC Assay Laboratory. Click here to download BSC Certification Decision Tree PDF. Certification: TWO 10-gram bottles and ONE 5-gram bottle of dye along with application form. Sample Recheck: ONE 5-gram sample of dye along with application form. Experimental: ONE 5-gram sample of dye along with application form. Processing and Results: Testing will begin when the sample is received at the laboratory. When completed, we will inform you of your results by mail. You will receive the Certification paperwork from the BSC, which will indicate if your sample has met certification criteria. If the sample has passed, you will also receive any labels that you requested. Affix labels: Affix BSC Certification labels to dye bottles to indicate that they have passed the Certification procedure by the BSC. The label includes the batch number from the manufacturer or vendor who submitted the original sample, and also the BSC’s reference number, which relates to our laboratory’s records. Click here for a printable summary of how to submit a sample. Certification testing: $500.00 + $1.80 per pound (or $3.96 per kilogram) of dye in the batch (4-6 weeks). Experimental fee: $275.00 (Similar testing to a Certification, without the Certification process). Recheck fee: $160.00 (~2 weeks). Labels order: (sold in multiples of five only): $1.00 per label (completed every Wednesday). Certifications: $200 addition to Certification testing fee (~2 weeks). Rechecks: $100 addition to Recheck fee (~1 week). Label orders: $20 addition to order (same or next business day). Late Fee: $100 (past 90 days due). Bottle Fee: $30 (for samples in non-archive quality bottles). All amounts are in US Dollars, payment terms are net 90 days. The Biological Stain Commission is a not-for-profit organization which is dedicated to the endorsement of histological materials. It is the mission of the BSC to ensure the quality of biological stains on the market that are sold by many US companies. The BSC endorses these products with the term “Certified” as is applied to the list of histological stains that are Certified within the BSC Assay Laboratory. Here are some general questions aimed at understanding the Certification process and the uses of the BSC’s Certified endorsement. What is meant by the term Certified? The Biological Stain Commission is a US organization which was founded over 90 years ago. In this organization, a quality control system was designed around histological stains. This was in response to World War I constraints that forced many new production facilities to make histological stains and were plagued with quality issues. The BSC currently Certifies a list of most widely used histological stains. When a company has a commercial use for these stains, a sample from the stain batch is submitted for Certification. This sample is analytically and histochemically tested against the BSC Assay Laboratory requirements. Passing samples are issued a Certificate in the submitting company’s name which is lot specific. What item is most important in identifying a Certified stain? When a new sample is submitted to the Assay Laboratory, the company labels the sample with a lot number. This new sample is also issued a BSC Certification code; which contains a company code, dye code and batch for that combination. Thus, one company will always have a similarly starting BSC Certification code. This code is the main identifier for the Certification results within the BSC Assay Laboratory. The lot number is the key identifier for the dye or stain material. Both of these elements are necessary in identifying that any material is Certified. A BSC Certificate joins the materials lot number along with a BSC Certification code to traceably Certify the stain. Many companies selling these materials also generate a product code for their catalog listing, this number is not used by the BSC in the Certification system. What happens when the lot number for the Certified stain is changed? The Biological Stain Commission has the capability to identify identical powders through analytical testing (much like a finger print). When a company is forced to change the lot of Certified material, the Certification no longer applies to that material. The recertification (or recheck) process can addendum the new lot for the stain powder to the Certification results after the identity to that material is verified. When this validation is complete, a new Certificate will be issued for the new lot number and recorded in the BSC Assay Laboratories archive. If a material is Certified and is purchased by another company, is the material still Certified? The Biological Stain Commission is the Certifying body for histological stains. When the term “Certified” is used for a histological stain, this directly states that the Biological Stain Commission endorses this product. In order for any material to be Certified, the endorsement must be clearly documented with the Biological Stain Commission. After the Certified material leaves the company from whom it was Certified, this product is no longer Certified for commercial use, unless that company follows up with the BSC. With few exceptions, this material has to be recertified with the BSC. In this way, the identity and performance of the stain powder is checked against the original Certification data. After this process, the Biological Stain Commission will establish an endorsement for the company who has purchased the material and can sell it as “Certified”. If there’s is a CofA that states a stain is Certified, is it? A company’s CofA (certificate of analysis) is a general summary sheet of characteristics of the product. Often, the CofA will state that this material has been Certified, or has items from the BSC Certificate regarding Certification results. This general company document does not specifically hold any “Certified” endorsement from the BSC. This endorsement can only come from the BSC’s original Certification document. While a CofA classifies this material as “Certified” for the company, it does not deem it at such. What are the documentation requirements for verifying a Certification status? The first requirement is that the company in possession of the material has a Certificate generated by the BSC specifically in their name. This is proof that they have followed up with the BSC and have followed a quality approach to validating the material they purchased. The other requirement is that all bottles of Certified stain powder are labelled with two labels: a BSC Certification label (which bears the lot number along with the BSC Certification code) and a companies label (which states the materials lot number). Why is recertification of a stain powder so important? After all, it was already Certified wasn’t it? Yes, it was Certified. Many companies have excellent quality systems established to track their products. Many of these systems were designed for handling specific materials that they specialize in. The Certified stains are a small part of their market and often these systems are not designed to specifically track a Certification that accompanies this material. It is hard to imagine that any errors occur, however; the BSC finds around a 3-4% error rate with companies that have their materials recertified. The recertification process compares a submitted stain sample to the original Certification results. Recertification errors are due to identity or performance reasons. So, a recertification verifies the identity of the stain as that Certified and ensures that the material is performing the same as the day the testing was complete. The recertification process is a critical check in maintaining that a powder is traceably Certified. Why is the BSC Certification Label so important when buying a stain? The BSC Certification Labels are issued directly by the Biological Stain Commission. Companies place orders for Certification labels when they are ready to bottle and label their Certified material for resale. These orders are checked against the BSC records to verify the lot number and BSC Certification code information before they are issued to that company. The BSC Certification labels are a Certification in their own right. In the fine print is a statement of Certification by the Biological Stain Commission. The Certification label also has the lot number for the material and the BSC Certification code for the accompanied testing results. The lot number on the companies material label is intended to match that on the BSC Certification label. In this way, the bottle containing the Certified powder is clearly stated as Certified with the presence of the BSC Certification label.